Yesterday, I smacked my head. I wasn’t doing anything cool. This isn’t a great adventure story. I was asleep. (See! Not cool!) Somehow, I’d worked my way on top of our short headboard, and then forcefully rolled over and whacked my head. It was loud. It was 4:00 in the morning. I woke up Christian and Izzy (our dog) with the noise. I tell you all of this to say, yesterday I wasn’t quite all there. Everything was a bit blurry around the edges. Even with painkillers, I could still feel the goose egg’s dull throbbing. 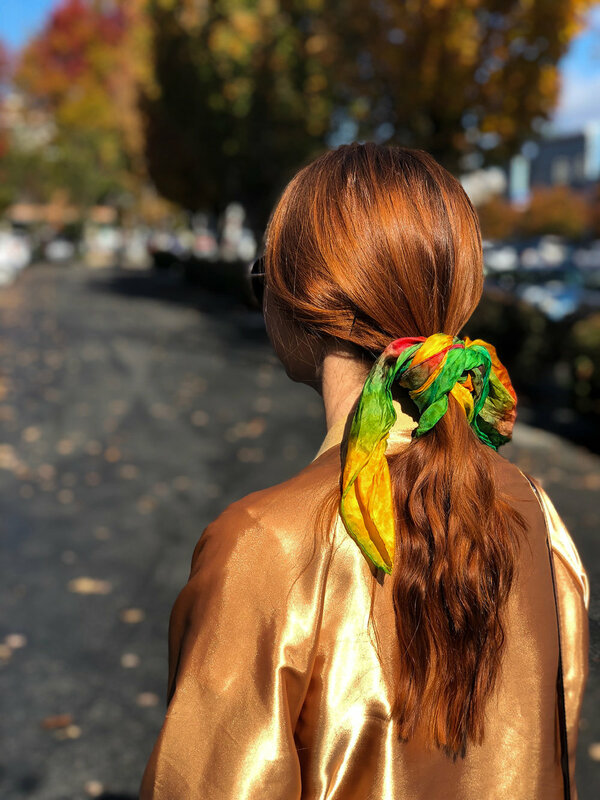 Some months ago, I tested out a silk scarf and felt like Grace from the Netflix show, Grace and Frankie. As I’ve always identified more with Frankie, I vowed to test out silk scarves again, but with Frankie as my inspiration. 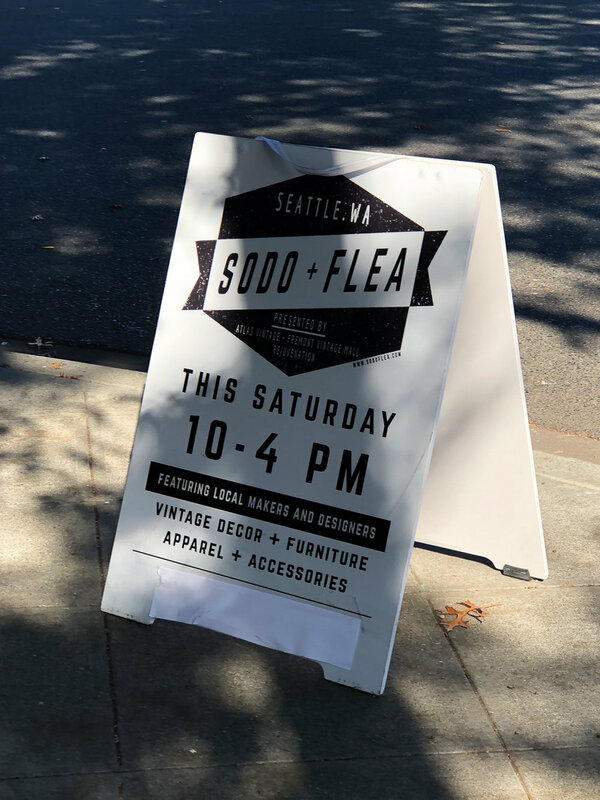 Yesterday, as our plan was to head to a flea market, felt like the perfect opportunity to channel Frankie. Plus, I told myself, if I looked too nutty, I could just say that I’d hit my head, and wasn’t quite in my right mind. Let’s get to the experiment! 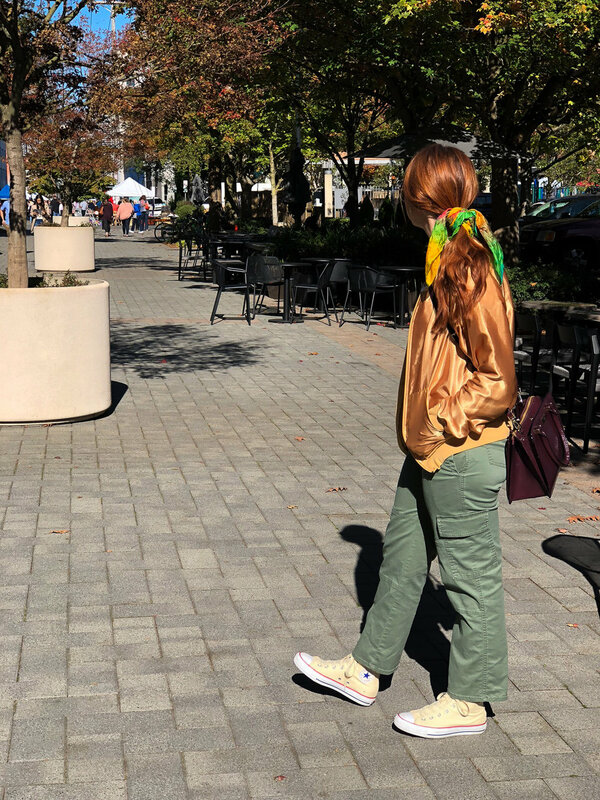 THE OUTFIT: This outfit began with the silk scarf. Mostly, I didn’t want to brush or wash my hair because my head hurt, so I (optimistically) thought that the scarf would distract from its dinginess. The scarf itself is long and tie dye. Though I rarely wear it, I love it and have carted it around for 10 years. Next, came the green, high-waisted, cargo pants I purchased for our honeymoon. (We went on a safari.) I didn’t feel like wearing tight pants, and their utilitarianism felt Frankie-approved. I’m sure she’d appreciate the large pockets to carry pretty rocks, crystals, or secrets. Then, a white T and Converse high-tops. Finally, for fun, my shiny gold bomber jacket. You can’t emulate Frankie without some fun. THE EXPERIENCE: This excursion was exactly what I needed. Our first week back post-honeymoon was rough, and it was nice to wander around in the sun for a bit. My husband hates leopard print, so whenever we find something leopard print, I always make sure to REALLY REALLY CONSIDER IT. 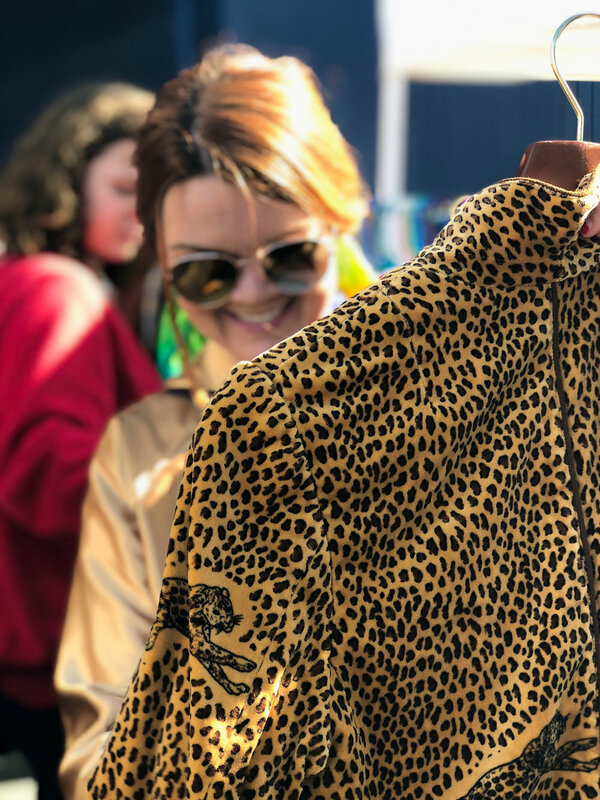 Still considering every angle of this velour jacket with both leopard print and leopards on it. to shopping. Mostly, I just wanted to be out and about. After the flea market, we headed to a park we’d never visited before, then home. Christian made my favorite soup, and we curled up on the couch with Izzy, an ice pack for me, and The Man in the High Castle. THE CONCLUSION: Unlike my previous attempt with silk scarves, in this outfit, I did feel more like myself. I felt interesting but not outlandish. Perhaps “interesting but not outlandish” is the best way I can describe my style these days - or at least, what I aspire for my style to be. What are you favorite places to visit on a sunny Saturday in Seattle? I’m attempting to get out and adventure more, and I’d love your suggestions!